Photographer Jodi Gerber of ArtisticLetters has created an entire catalog of black & white letter images throughout the past 3 years – all by taking photos of objects in nature that resembled letters of the alphabet. She recently decided to offer her ENTIRE catalog of 250+ letter images to the public on CD or Download so that anyone could create their own designs! It’s a truly original way to make artwork for your home - or even for scrap booking, greeting cards, and digital designs consisting of wedding invitations, baby’s birth, etc.). Endless possibilities for whatever the mind can imagine! I am not a super crafty or artistic person, though I do kill myself creating scrapbooks and calendars every year. I really liked this product! It helps people like me that are not very crafty and artistic appear like we are. The ABC artwork is very unique and really pretty. And her website has tutorials on how to make projects. I personally love the one for soap bottles. 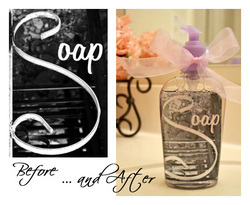 You can take a simple bottle of soap, remove the label and then make a projects like this. I'm going to have to try this one out. No need to buy expensive soap, just head to the dollar store and make your own pretty bottle. I also love this idea for my family room or for gift ideas. In this economy, making gifts is a very practical and personal approach. We have a few weddings coming up and I know I'll be making some gifts. I remember how much I liked getting something personal when Brett and I got married. And since there are so many different projects you can make with the photos, everyone can get something different. You can also make wedding invitations, baby announcements, and cards with the pictures. There are tons of ideas on her website and I'm sure you'll have tons of fun making projects. Jodi teamed up with me and is offering my readers Exclusive Discounted Pricing of up to $6 Off! Please visit her website www.BuyAlphabetPhotos.com and browse the images, testimonials, and ideas. Then check out the Exclusive Pricing and Freebie by clicking on this link exclusive offer. The exclusive pricing and freebie offer expires Saturday, June 11 at midnight so be sure you take advantage of this great deal while it lasts. You can also check out her Facebook for more ideas and offers. Thank you for the follow and thank your for the formula advice. I will be sure to try your no heating trick. I can use all the simplicity I can get.